The 11th Garshom international awards presented at Malacca Cultural Center (Panggung Seri), Taman Budaya, Malacca on 17 December, 2016. The Hon. Deputy Chief Minister, Govt. of Malacca, Malaysia, Md. 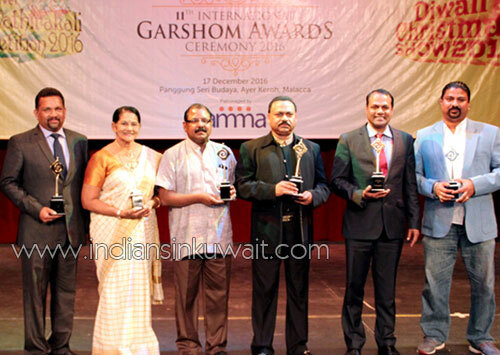 Yunos Husin inaugurated the 11th Garshom Awards presentation ceremony. The Hon. Minister for Human Resource Development, Govt. of Malacca, Malaysia, Datuk M. S. Mahadevan given away the awards. Dr. Francis Cleetus from Abu Dhabi, Mrs. Mani Menon from Malaysia, Dr. Manoj Kumar from USA, Mr. Manoj Mavelikkara from Kuwait and Mr. Shijo K. Francis from Bangalore were awarded the Garshom Pravasi Ratna, Pravasi Vanitha, Yuva Pravasi and Special Awards respectively. 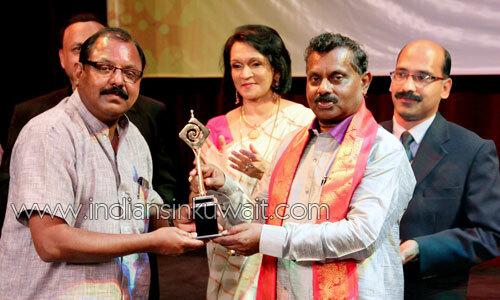 The award for the Best Pravasi Malayali Association awarded to Hong Kong Malayalee Association for Arts and Culture (MAAC) was received by it’s founder secretary Mr. K N Suresh. Manoj Mavelikkara, working with MEW Kuwait is an active social worker in Kuwait and is associated with several community activities. All Malaysia Malayalee Association president Datuk Suseela Menon, Program Organizing Committee Chairman Dr. N R Nambiar, Tan Sri Raveendran Menon, Garshom Awards 2016 Jury chairman Mr. Joseph Scaria Junior, Garshom Foundation, Secretary Mr. Jins Paul, Garshom Infomedia Ltd, Executive Director Jaijo Joseph and Malacca Kerala Samajam president Dr. Jayasankar are felicitated the awardees. Congratulations Mr.Manoj,You have a great power do more & more. Congratulations for achieving this award and we are proud of you. May God Bless. Congratulations to our Dearest Manoj Mavelikkara. This is the gift for your effort and your kindness. God Bless You more and more. Congrtaulations. It is really deserving one for your social activities. God Bless You.